The following characteristic specifications describe values that are relevant to the use of the model under stated operating conditions but are not covered by the model warranty. 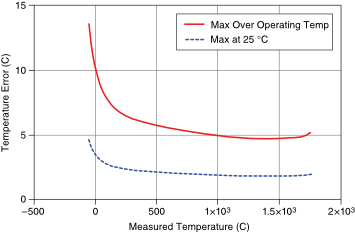 Typical specifications describe the performance met by a majority of models. Nominal specifications describe an attribute that is based on design, conformance testing, or supplemental testing. Specifications are Typical unless otherwise noted. 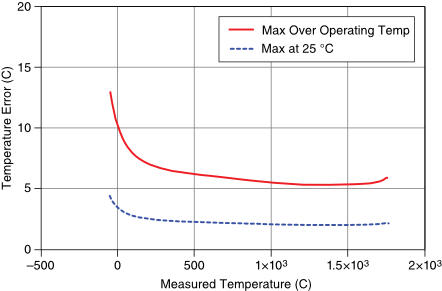 Electromagnetic interference can adversely affect the measurement accuracy of this product. The input terminals of this device are not protected for electromagnetic interference. 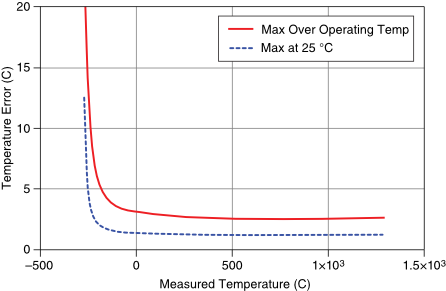 As a result, this device may experience reduced measurement accuracy or other temporary performance degradation when connected cables are routed in an environment with radiated or conducted radio frequency electromagnetic interference. 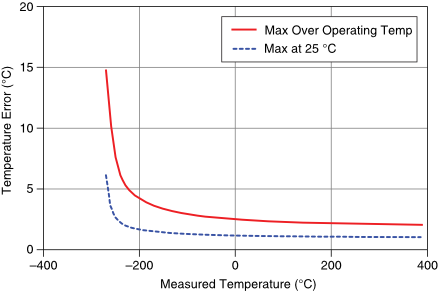 To limit radiated emissions and to ensure that this device functions within specifications in its operational electromagnetic environment, take precautions when designing, selecting, and installing measurement probes and cables. 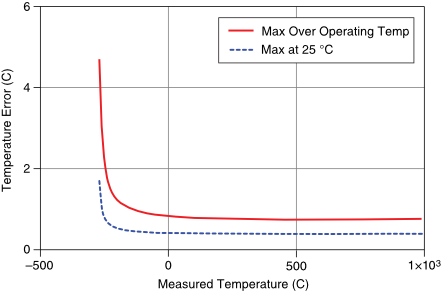 The following figures show the errors for each thermocouple type when connected to the USB-TC01. 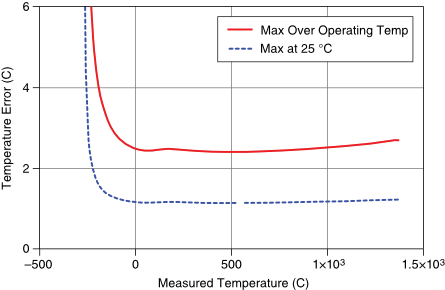 The figures display the maximum errors at 25 °C and over the full operating temperature range, and account for cold-junction compensation errors. 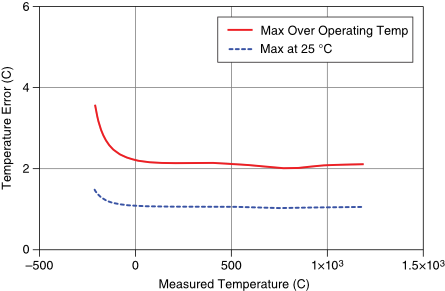 The figures were generated using thermocouples connected to subminiature connectors of the same type. The CJC sensor resolution is 0.0625 °C, which is the minimum value of the CJC step width. 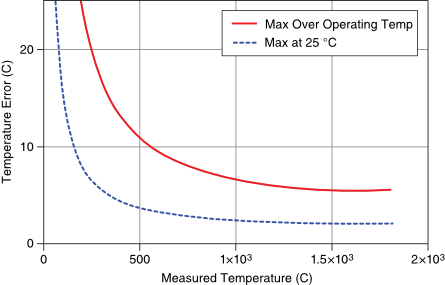 As such, the reading may result in a sawtooth curve rather than a square curve as the temperature inside the board changes. This is the expected behavior. Connect only voltages that are within these limits. Measurement Categories CAT I and CAT O (Other) are equivalent. These test and measurement circuits are not intended for direct connection to the MAINS building installations of Measurement Categories CAT II, CAT III, or CAT IV. This device is not certified for use in hazardous locations. In the United States (per FCC 47 CFR), Class A equipment is intended for use in commercial, light-industrial, and heavy-industrial locations. In Europe, Canada, Australia and New Zealand (per CISPR 11) Class A equipment is intended for use only in heavy-industrial locations. For EMC declarations and certifications, and additional information, refer to the Online Product Certification section.